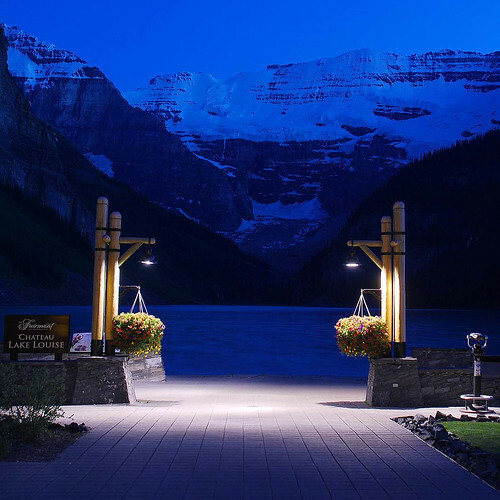 This photograph takes a symmetrical perspective of Lake Louise at night. With the frame beautifully balanced by the two light posts and hanging flower baskets, the snow capped mountains in the shadows brings viewers an experience that may only be relived through the image. Using a special exposure technique, photographer Gord McKenna created a unique blue tint on what was originally a pitch-black image, offering an artistic take on a popular tourist destination. Hiking Larch Valley from Moraine Lake is a popular trail, especially in the autumn when the alpine larch trees turn a radiant golden hue. There’s a 350 m (1150 ft) elevation gain in the relatively short 2.4 km (1.5 mi) one-way hike. And with a meadow near the top, you are rewarded with unobstructed mountain vistas and panoramic view of the Valley of the Ten Peaks. Group Access: Hiking Larch Valley may require hikers to travel in a tight group of four or more if grizzly bears are in the area (check with Parks Canada 403-522-3833). The scenic Canadian Rockies have knocked the socks off travellers since explorer David Thompson came here 200 years ago. Today, sightseers can choose a human-led or GPS-triggered tour.